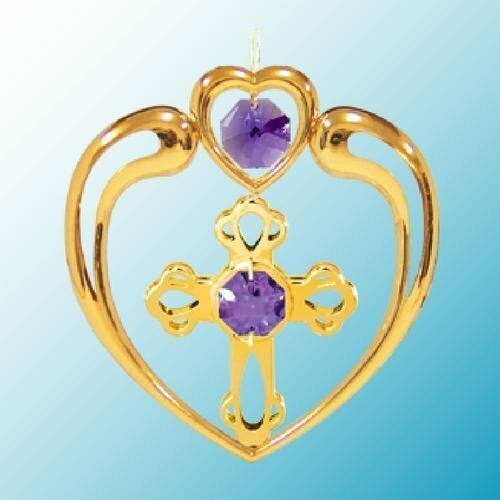 This 24K gold-plated cross pendant ornament features purple Austrian Swarovski Crystal. The ornament is 3.25″ x 2.5″ X 2″. This is an Original Crystal Delight Ornament! Wow!!! This is just Gorgeous and absolutely the perfect finishing touch for just about anywhere in your home! Great as a gift! Swarovski Crystals sparkle beautifully in a gold finish ornament. This is gold-plated so it will never tarnish! Truly an outstanding piece! It’s so cute, the pictures don’t begin to do it justice! Just imagine how the crystals will sparkle and pick up the lights on the Christmas Tree! Can be used in so many ways — on the tree, in the window, on your package with the bow or as a Hostess Gift! This ornament is Brand New with Tags. Best Gift for your family and friends. Also for All Occasions and for Timeless Collectibles.